Originally published in 1985. Detailed exploration of the dynamics of language within social psychology forms a social psychology of language which is distinct from other approaches. 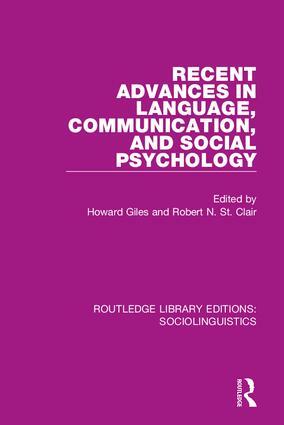 This volume presents some of the growing body of research in this area, with many theoretical models and ideas - chapters consider the relationship between language and social situations, looking at cognitive structures in how communication between individuals develops in childhood and beyond, how it defines social situations, influences others, expresses feelings and values, evokes social categorizations and how it can break down. Reissuing works originally published between 1978 and 1992, this collection includes books across the span of sociolinguistics, from its theory and philosophy to specific language change study. This small set will be of benefit to sociology and linguistics but also to psychology, media and communication, education and development studies.